We opened the USD/JPY signal that’s live on our signals page a while ago when this forex pair was retracing higher after trending down for weeks. The chart setup was bearish and the retrace seemed to be over, so we took this forex trade. Basically, USD/JPY has been declining since the beginning of this month, so any retrace higher should be a good opportunity to sell. That’s how the forex textbooks explain trend trading. You are on the right side and the risk/reward ratio is much better than selling the pair at any place. The stochastic indicator on the H1 and H4 charts were overbought, which meant that these charts were overbought. Besides that, the 20 SMA was providing resistance on the H4 chart, while on the H1 chart it was the 50 (yellow) and 100 (green) SMAs. They did a good job actually and sent the pair back down again. At some point our forex signal here was well in profit. But, the 20 SMA (grey) on the hourly chart kept the price afloat. You can see that it has provided support and resistance before and it did the same today. The US consumer confidence report that was released just now also went against our signal and teamed up with the 20 SMA, sending the USD higher. 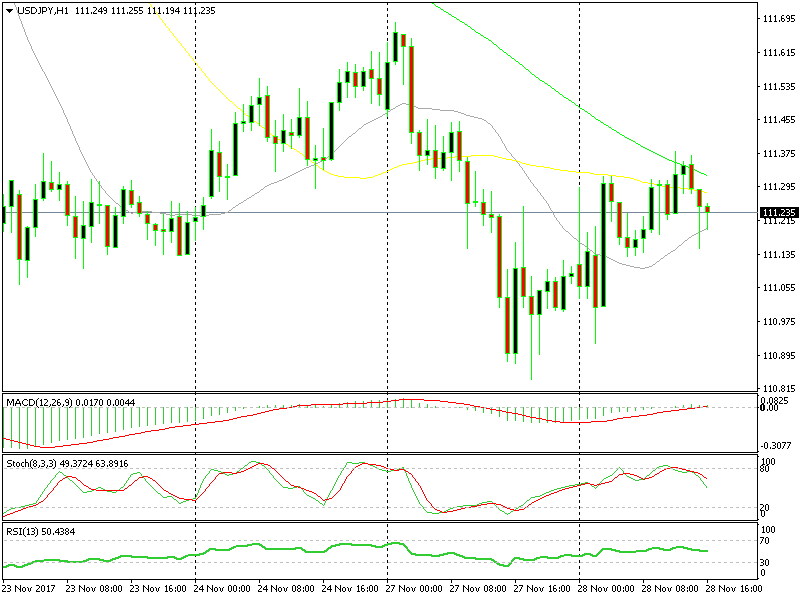 Now, we have broken above the 50 and 100 SMAs on the hourly forex chart, which means that the road north is now open. But, the H4 chart is still overbought, so hopefully the sellers will return and USD/JPY resumes the downtrend again.